For pet owners who think they’ve tried everything to get their pet to shed some excess pounds, a solution may be available, albeit from an unlikely source: television. 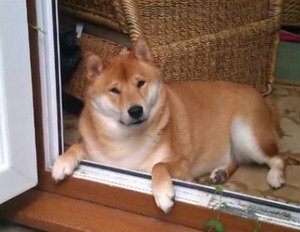 Dexter, a Shiba Inu, rapidly gained weight after he was neutered; he regularly steals Fat Ball bird treats. Reality-TV show The Biggest Loser pits humans against each other, and the one who loses the most weight in the shortest amount of time wins a cash prize. The results have been dramatic, so why not use a similar format for pets? That’s exactly what Pet Fit Club aims to do. The U.K.-based contest features 18 contestants that collectively weigh 336 pounds. Contestants include Bobby, a rabbit that weighs more than 5 pounds; Jumbo Jack, a 45-pound Cavalier King Charles Spaniel that hobbles because of his excessive weight, and Fifi Bottomley, a cat that clocks in at 21 pounds. The show is run by People’s Dispensary for Sick Animals (PDSA). Fit Club contestants are put on a six-month weight-loss exercise and dietary plan custom-tailored for each pet. The animal that wins gets a year supply of diet pet food and his owners receive a stay for two at a Four Seasons Hotel. The contest concludes in September. Interested parties can sponsor each animal finalist. According to the PDSA, more than 1 in 3 dogs and 1 in 4 cats in the U.K. are overweight or obese; the organization estimates that 50 percent of pets will be obese by 2013.